The Republican Party wants us to believe that it suddenly discovered Steve King was a racist when he gave that New York Times interview., It's clear that something changed in the GOP recently, though the interview wasn't the precipitating factor. Doesn't anyone find it odd that King got a high-profile, Republican-establishment primary challenger nearly two years before his next election, and just before the Times interview and his subsequent removal from his House committees by the party? Primary challengers in House races don't usually announce two years in advance -- hell, it's only in the past few decades that presidential candidates have announced that far in advance. I think people in the Republican Party looked at the 2018 midterm results, recognized that suburban white voters are attracted to the Democratic Party's opposition to racism, and decided to send the message now that we should pay no attention to President Trump (whom they're afraid to challenge because he's so popular with the base) or the immigrant-bashing of the shutdown -- the GOP is the party of Lincoln again! No, really! The push to condemn Mr. King illustrated how alarmed senior Republicans are about the party’s image just two months after they lost 40 House seats, most of them in suburban or diverse districts — including seven in Mr. McCarthy’s home state of California, where the G.O.P. is on the brink of extinction. I guess McCarthy doesn't agree with many in his party's base that all those California seats were won as a result of Democratic cheating after Election Night. 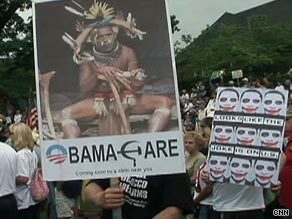 In the past, Republicans have been inspired to reject racism by bad election results, but only momentarily -- they were going to rebrand the party in response to Barack Obama's election, but then they decided to go with Tea Party demonstators waving signs depicting Obama as an African tribesman with a bone in his nose. I'm guessing the party will revert to form once again -- with Donald Trump as president, what choice does it have?